Wing Chun Wooden Dummy: Steps to teach you to learn how to build a Wing Chun kung fu Wooden Dummy for your Kung Fu training. Include Wing Chun Wooden Dummy Materials, Body, Arms, Legs, Cross Pieces, Frame and Finish Working. Learn how to build Wing Chun Kung Fu Wooden Dummy, here we shall begin now. Attention please. Mook Yan Jong – literally translates “wood man post”, but is generally called a “wooden dummy” in English, or “jong” for short. The dummy consists of a body with two upper arms at shoulder level, a lower arm at stomach height, and one leg, suspended on a framework by two crosspieces. 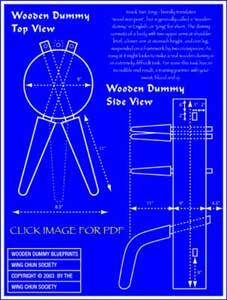 As easy at it might looks to make a real wooden dummy is an extremely difficult task. For some this task has an incredible end result, a training partner with your sweat, blood and qi. Teak was often traditionally used for all parts of the dummy. But, since solid blocks of this exotic hardwood are increasingly hard to find, you can use almost any strong hardwood – one that’s heavy, strong and dense, but not brittle. Some softwoods may not have enough strength to withstand the force applied to a dummy, or have the proper weight. Another problem with softer wood is that over time, as the arms and legs are struck repeatedly, they become compressed and more “sloppy” in their movement. Because it’s difficult to get hardwood in a piece large enough, you might try laminated wood (although the look will be different with all those lines running through it). Avoid wood with pitch in it, and the wood should be well seasoned – dry all the way through – to avoid cracking. Try to find wood native to your area since transporting it from a different climate, especially with different humidity, can cause cracking. Even with these precautions wood will still sometimes check or split, in which case you might use a wood fill or banding. Use hardwood for the body so its weight will correspond to that of a human body. This way if you can move the dummy you can also move a person. The body has a round cross section of about nine inches in diameter. Anything smaller doesn’t give the needed weight and requires adjustments in the length of arms and leg. The height of the body is five feet. Make the cross section for the wooden dummy as close to a perfect circle as possible. Irregularities in the surface could cause damage to hand, fist or foot. The body should be smooth, though not necessarily polished, to avoid splinters. Slightly taper or round off the top and bottom of the body to remove hard edges. One of the hardest parts of dummy construction is cutting the square holes for the arms. First drill circular holes, then square them with hand chisels. In order to give both arms room to pass through the wooden dummy, the left arm (facing the dummy) is slightly higher than the right. The holes intersect at their outer edges where they cross in the exact center of the dummy. An advantage of hardwood is that you’re less likely to tear up the center of the dummy as you cut these overlapping holes. The arms should be the same material as the body, since they need as much strength. Stress on the arms is at the point where they enter the body. Turn the arms on a lathe, rather than make them by hand, since a smooth level surface is essential. All three arms are identical Each is twenty-two inches long, divided into two sections: one eleven inch half goes through the wooden dummy body and out the back, the other eleven inch half sticks out from in front of the dummy. All three arms are set parallel to the floor. The visible half of the arm, extending from the dummy, is cylindrical – though wider at the point where it leaves the body and tapering smaller towards the tip. The widest part, closest to the dummy, is two and a half inches in diameter. The amount of taper differs, but a loss of about an inch, down to one and a half inches in diameter at the tip, is average. Slightly round off the tip end so there are no hard edges. The inner hidden half of the dummy arm has a square cross section. Though it’s far easier to make the inner half cylindrical, this would allow the dummy arm to spin on contact – unlike a real opponent’s arm. This half of the arm can be either in line with the outer half, or offset from center so one corner of the inner half touches one edge of the outer half while the opposite corner of the squared inner half is inset from the edge of the rounded outer half. While this offset is more difficult to make, it allows the wooden dummy arms to be adjusted to different angles simply by switching or turning the arms, causing the width apart at the tapered ends to be changed. While the distance apart at the tips depends on your own body – the upper arms point at your shoulders when you stand at an arms length away from the dummy – the average is about eight and a half inches. The upper arm is nine inches down from the top of the dummy. The lower arm is eight and a half inches down from the upper arms, extending straight out from the center of the body. The holes cut in the body for the arms should provide a fairly tight fit, neither too tight or too loose. Your technique on the dummy can be judged by the sound of the arms moving in their holes: a dull thud indicates tension in the arms, caused by holding back power, while a sharp “clack” shows power has been properly passed to the wing chun wooden dummy without force being reabsorbed into your own arm. Extend the dummy arms through the body and out the back two inches. Secure the arm in place with a removable pin or wedge. The leg is divided into two sections: one half extending through the dummy and out from the front center of the body to a “knee joint”, the other half extending down towards the “ankle”. The leg is the least standardized part of the dummy. The upper part of the leg may come straight out from the dummy, parallel with the floor, or it may extend downwards at an angle. The lower part of the leg may come straight down, at a right angle to the floor, or it may extend forward at an angle. It is meant to correspond to your own leg, if you were to stand with one leg forward, so keep this pattern in mind when making your wooden leg. Use the knee joint as your guide and have it roughly at the same height as your own knee. The upper section of the leg is twenty-two inches long: one half of which extends through the dummy and out the back, the other half extending out in front. The part that passes through the wooden dummy must be smaller than the part that is visible, so the leg won’t slide back up into the dummy. The lower “hanging” section is about thirteen inches long. As with the arms, the leg is secured in back with a removable pin or wedge. The diameter of the leg is not standardized, since it was traditionally made from a hardwood branch with a knot and bend where the knee would be. This makes a functional, and pretty, leg, but suitable tree limbs are hard to find. A square cross-section leg with a joint at the knee is much easier to construct. Anything less than two by two inches will be too weak to stand up to steady use. Round the edges slightly so kicking the leg is easier on the feet. The section of the leg extending through the wing chun wooden dummy must be cut with a square cross-section, to eliminate any rotation of the leg in its hole. The leg leaves the dummy at a point roughly sixteen or seventeen inches from the base of the body. Because the angle of the leg can vary the hole may be raised or lowered as needed. The bottom of the leg should line up with the bottom of the body, about six inches above the floor. Stress points are at the knee and where the leg passes into the wooden dummy. Use a strong hardwood, since the leg must withstand a great deal of kicking force. And, as with the arms, it’s a good idea to have a spare leg on hand. The dummy is suspended above the ground by two crosspieces or slats, each one inch wide by two inches high. No matter what wood is used for the rest of the wooden dummy, these crosspieces must be a strong hardwood since they receive most of the force given to the dummy. On the other hand they must not be too brittle, otherwise they will crack rather than flex under stress. Stress points are at the spot where the slats first pass into the dummy. It’s a good idea to have an extra set of crosspieces on hand for the inevitable day when one cracks. The crosspieces should be no less than five feet long, so they are long enough to flex when the dummy is moved forward or backward, and long enough to extend out several inches on either side of the framework. The top crosspiece is six inches down from the top of the dummy, the bottom crosspiece is nine inches up from the bottom of the dummy. At this distance apart they provide support so the dummy does not tip forward or backward when moved. Also, if the top crosspiece is any closer to the top of the wooden dummy it gets in the way of a neck-pull. The crosspieces must be cut perfectly parallel to each other, the top directly over the bottom, otherwise they will bind, and not slide, in the supporting framework. They should also pass directly through the center of the wooden dummy for best balance. Attach stops so the dummy body won’t slide on the crosspieces – the body and slats should move together. Put another set of stops on the crosspieces to keep the dummy from sliding all the way out of the framework on either side. Attach these supports securely to floor, walls, or ceiling. Set them far enough out from anything behind to allow for forward and backward movement of the dummy. “Life” in the dummy is provided in two ways: by flex in the cross slats when you move the dummy forward or backward, and by these slats sliding in the framework when you move the dummy side to side. Although the dummy should be suspended about six inches above the floor, the actual height of the dummy from the floor depends on your own height: the upper arms point at your shoulders. You can make the dummy portable by cutting downward pointing L-shaped slots in the uprights to hold the crosspieces. You can then lift the dummy in or out of the top of the slot and then drop it into the bottom of the upside-down “L” to keep it in place. These slots also provide a way to adjust the height of the wooden dummy. Cut the bottom of the slots at the lowest height needed for the dummy then, to raise the dummy, insert wooden risers in each slot. You can also support the crosspieces on L-shaped brackets attached to the front of the uprights. You don’t need to use oil or stain to finish the wooden dummy, natural oils from the hands and arms will eventually seal and color the wood. I personally use a all natural lin seed wax to finish my dummies. Never kick the arms, as shoes can damage the finish and scratch the wood. Remember, the trunk is for striking and the arms are for flowing around. Learn how to build Your Own Wing Chun Wooden Dummy now. Isn’t it easy? Then go home and build one for your Wing Chun Kung Fu training. See you later.